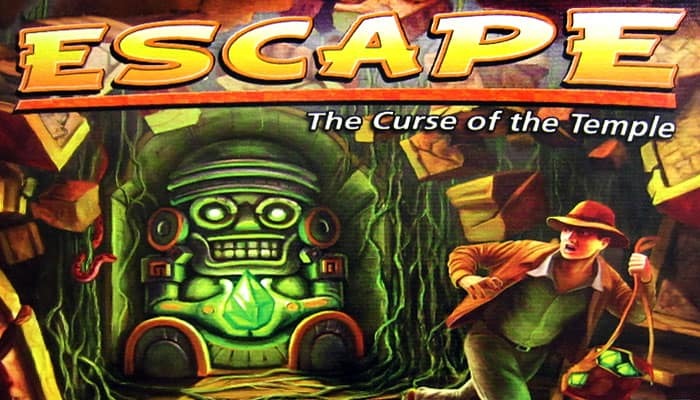 Escape: The Curse of the Temple is a cooperative game in which players must escape (yes..). from a temple (yes..). which is cursed (yes..). before the temple collapses and kills one or more explorers, thereby causing everyone to lose. Escape is played in real-time, with all players rolling dice and taking actions simultaneously. You must roll the right symbols to enter a room, and if you're at an open doorway, you can roll to reveal the next tile in the stack and add it to that doorway. Some rooms contain combinations of red and blue symbols, and if you (possibly working with other players in the same room) roll enough red or blue symbols, you "discover" magic gems, moving them from a separate gem depot onto that tile. 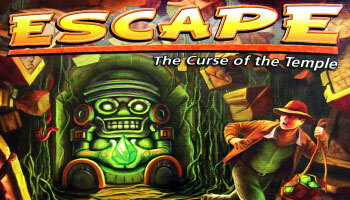 Escape: The Curse of the Temple includes two expansion modules that can be used individually or together. With the "Treasures" module, some rooms contain treasure, and when you reveal such a room, you place a face-down treasure chest on the tile. Roll the symbols on that chest tile, and you claim the treasure for use later: a key lets you teleport anywhere, a path lets you connect two rooms that otherwise have no door between them, and a medic kit heals all players instantly (putting black dice back into play). With the "Curses" module, some tiles "curse" players by forcing them to place one hand on their head, keep mute during play, or otherwise do what you wouldn't want to do while escaping a temple! You must activate the magic gems in the temple chambers in order to banish the curse, and you have only ten minutes to do so before the temple collapses. Don't sit still for a second - start running now and you might just escape! 1 Supplement for the 2 modules "Curses" and "Treasures"
1 Supplement for the expansion "The Sand of Fortune"